I hunched over on a bench tapping fingers and fidgeting feet. Tides of queasy impatience lapped up in my gut every time I took a deep thought of what I was about to begin. Looking out over the mosques, pigeons wheeled in the city sounds rising from old streets entwined with contending life. My eyes fell to my feet, clouds of worry aimlessly floating behind a tired-wide stare. And through my torn trainers I felt the rust chewed iron deck shiver into life and the old boat frothed off from the bank. I took a look back to Europe. From the opposite bank, Asia rolled on and on. One slither of water split the sprawl of Istanbul and two continents. So why did crossing this tiny gap feel so significant? How different could they be? I knew I could cycle in Europe, knew what would happen if I carried on. But looking on to Africa was a big, doubtful question I had pondered the answer to for months. And in those beginning months, the carrot on the stick driving me away from home one squeezed mile at a time was to reach Istanbul. Maybe crossing Europe would be enough, maybe I could go home with a little pride, a decent effort, far enough for a bike ride. Either way, I had adopted the method of crossing bridges when I came to them, which had worked over the past few months. A knack I had picked up in school when a teacher threw my math exam paper in front of me scrawled with red crosses - to push worries to the back of my mind - 'you'll deal with it when you have to' - and that thinking had nudged me cross Europe, had dared me to begin the trip. Something it didn't help was the actual scary yet tiny moment when I had to take the jump. When there's nothing more to do but say 'bugger it' and begin. A week or so later, I sat on the curve of a road, a lump of mountain lay in-front of me, almost like we were sat together in the silence. A truck roared around the corner with a beep. The hope of reaching Africa was bigger than ever, but did I have it in me? Europe was still close enough to turn back. I was tired, my mind did this at these times and I was beginning to recognize the spiral. The Turkish mountains stretched me like rubber ready to tear and I wondered, should I give up? 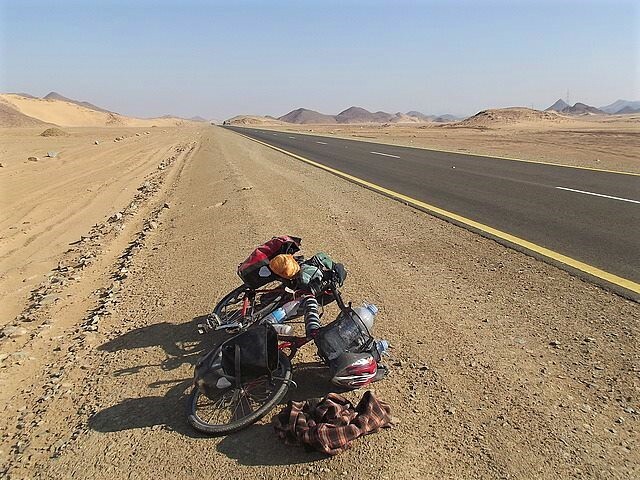 It didn't matter anyway - sitting there did nothing - at the very least I had to cycle to the nearest airport. Doing nothing helped nothing. I wouldn't get any closer to anything. So I climbed back on the bike and moved that bit further. That evening I free wheeled down a long sloping road toward a village twinkling down in the valley. Two massive farm dogs ran along the fields giving chase. The sun set and burned the hills in fire orange. Pulling to a stop in the dark cold town, a man looked at me from his shop doorway. I asked him if I could pitch my tent in the park, he barely answered and flicked through his phone to make a call. I stood over my bike, the black air beginning to bite and my worries beginning to boil - where will I sleep? I should have stopped earlier, but cycling down hills are like a pub at the end of a first pint: Hard to leave. A mini-van appeared and me and the bike ushered in the back. The Turkish again clubbing together to help the idiot traveler. We arrived at a one story student halls, a few lads welcomed me in, gave me tea, food, a pipe and we danced to bad music and laughed together the same as my old mates. Later the driver appeared again - 'Bob, do you like whisky?' - 'No its disgusting, but yes I would like some'. And we drank a lot. One of those nights where a hangover begins to appear before I had even gone to bed and the morning came with a ripe thumping headache. After breakfast we went to a friends clothes shop. I was so hungover I just wanted to ride out of town and crawl in my tent somewhere, but I found myself in a changing room trying on jumpers, trousers, boots, all sorts of stylish garbs I had little option but to take - for free! As I filled my panniers with new stuff, two more bags tied full of cakes and biscuits appeared. I hooked them on the back without anymore room and waved my friends off: A group of ten stood by the road waving a smiling like I was part of the family. My hangover lifted as I rode and so did my mood. Yesterday I could have gone home crying, drowning in the doubts, wondering what to do with my life. But moving one step further and everything had changed. I didn't no what to do by that roadside, but I had do something and by doing something rather than nothing, my situation looked so different from a different place. I had a lot more moments like that, sat by a road with traffic whizzing past, looking at the bike and not wanting to carry on, wondering what I was doing it all for. But instead of deciding, I learned to ride one more mile. If you don't no what to do, do something, do anything, but don't do nothing. love your content, mate. Post more when you can!